Visiting Yellowknife is a once in a lifetime adventure and your stay at the award winning, licensed and health and fire inspected B&B/ Small Inn and expereince the diffrence. 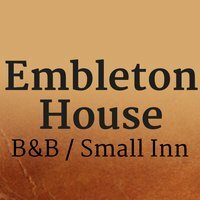 When you stay at Embleton House we prominse to give you a heart warming, comfortable northern experience. Yellowknife is on the Northern shore of the Great Slave Lake and offers an exciting blend of modern elements and a small town character. Whether you like to embrace the outdoors or spend time inside, Yellowknife has something for you. The Embelton family has been calling Yellowknife their home since 1945, so their unmatched expertise on the city can truly provide you with the special experience you’re looking for. Many stops of interests in our city are within walking distance of Embleton House such as, restaurants, art galleries pubs and entertain, the theater, and the Northern Arts and Cultural Center. For business travellers we are a five minute walk from the Federal Building and most private industry, government offices. In just a few minutes you can walk from here to the park or other places that are suitable for seeing the Aurora. You can walk to Great Slave Lake in about 15 minutes from here. Embleton house offers several different accommodations to suit your needs. We have four private luxury studio Suites and a three private bedrooms in a shared guest apartment. All four suites have private bathrooms and additional to full private bathroom with tub vanity and shower have air massage tubs for two. Toiletries and linens to use are included. Two suites have couches, skylights and fireplaces. Two have extra beds. All have digital cable TV WI-FI Kitchenettes; private phones with voice mail. Breakfast foods hot and cold are provided for a self-serve, self-made breakfast at your choice of time. Guest are welcome to bring in food and cook other meals. There is also a BBQ for guest use. Our accommodation is ideal for allergy suffers. We have fresh air exchange, no smoking and no carpeting or pets in B&B areas. We are an ecofriendly business that recycle and use ecofriendly cleaning products. Our building is safe. It has a water sprinkled fire suppression system throughout and has a hard wired fire alarm. Our heating system is hot water and comes from another building adding one more level of safety to this home. . Candles are not allowed in guest premises but LED candles are supplied. All doors to rooms and suites have privacy keyed locks. All entrances have computerized locks. There is always someone accessible to look after situations should there be a problem or concern. Offering Two award-winning styles of B&B in one location. Standard private bedrooms in a shared guest apartment and four Luxury B&B Studio Suites/ Hotel Rooms. Canadian Cystic Fibrosis Foundation of Canada.